Kanye West proposed to girlfriend Kim Kardashian on her 33rd birthday Monday, Oct. 21, and she said yes! West rented out AT&T Park in San Francisco and projected a proposal message on the stadium screen in front of Kardashian’s assembled friends and family members. 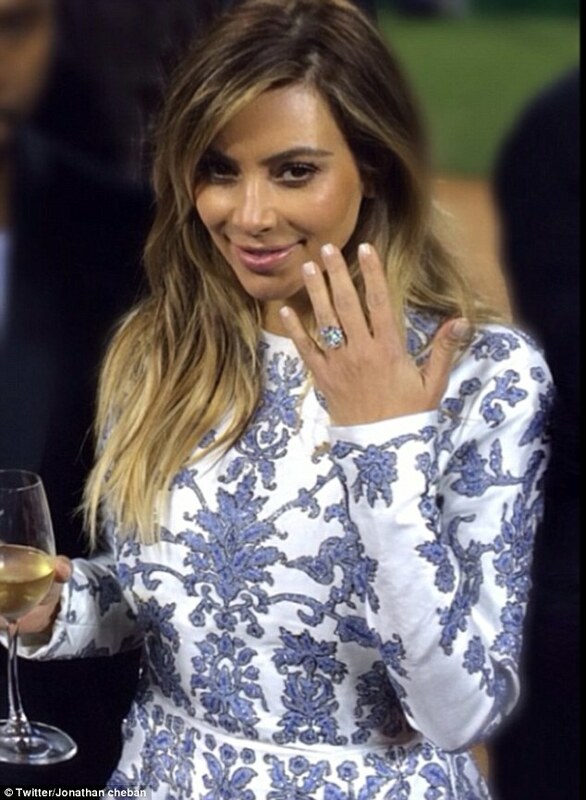 West proposed to Kardashian with a 15-carat diamond ring by Lorraine Schwartz. The ring is a D flawless cushion cut and a perfect diamond. The couple have a 4-month-old daughter, North, together. Kardashian’s new ring is similar in style to her old one from ex-husband Kris Humphries. Humphries, whom Kardashian filed for divorce from after 72 days of marriage in October 2011, proposed with a 16.21-carat center diamond and two 1.8-carat side diamonds. The ring, reported to be worth was $2 million, sold for $749,000 at a Christie’s auction in New York City on Oct. 15. Much different than her wedding to Humphries, Kardashian is planning a smaller event on an island with just close friends and family.